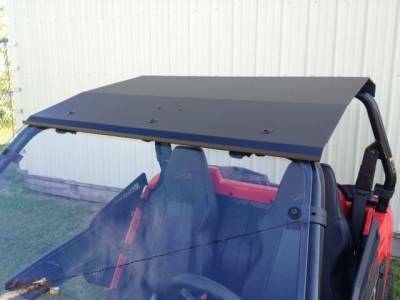 Wildcat Trail (50” wide)and Wildcat Sport Aluminum Top Fits: 2014-16 Arctic Cat Wildcat Trail (50” wide)and 2015-16 Wildcat Sport DOES NOT FIT: Wildcat 1000 Made from nearly 1/8” Thick Aluminum. Front and Rear Rain Gutters divert rain to the sides. Hemmed sides make a smooth edge. Laser Cut and CNC Formed in insure a perfect fit. LED Map Light Included. Includes; Mounting Hardware. Powder Coated Texture Black. Made In Cleveland, Ohio. Protects both the driver and passenger from rain and sun. Fabricated from 5052 Aircraft grade aluminum. The front and rear have rain gutters to add strength and divert rain water to the sides so it does not fall on your lap or back. Powder coated with a texture black for superior protection and style. The LED map light comes in an aluminum housing and will run up to 100 hours on the batteries provided. Laser cut Stainless steel logo plate on the rear. Pictured the EMP Hard Coated Polycarbonate windshield P/N: 12548 and Polycarbonate rear cab back P/N: 12550.